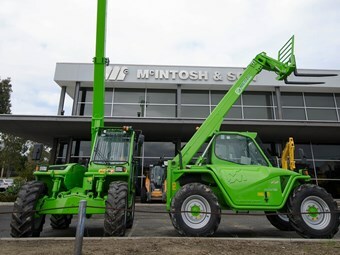 Materials handling specialist Merlo has recently appointed McIntosh & Son as its new distributors in the states of Queensland and Western Australia. McIntosh & Sons has recently been appointed an official distributor for the Merlo brand of telehandlers. From now, McIntosh & Son’s branches in Dalby, Queensland; and in Perth, Geraldton, Kulin and Wongan Hills in WA will be offering Merlo’s range of machines. McIntosh & Son Director Stuart McIntosh says his team is pleased with the recent appointments. "Merlo telehandlers have a solid reputation in the industry as advanced and reliable machines," he says. "For customers who require multi-purpose machinery, the versatility of Merlo offers the ideal solution." Merlo General Manager Wayne Munce says his company is proud to be partnered with an Australian family-owned company. "McIntosh & Son is an Australian industry leader and we are proud to welcome them to our dealer network," he says. "Merlo is dedicated to a strong dealer support infrastructure with an emphasis on the customer. We are confident the appointment of McIntosh & Son will only strengthen the Merlo network." Established in 1955, McIntosh & Son specialises in agricultural and construction equipment sales, service, parts and finance. In addition to the branches added to Merlo’s dealer network, the company also has branches in Albany, Katanning and Moora in WA. Find Merlo telehandlers for sale. Look up Merlo telehandler specifications.